The trick to creating content marketing campaigns is to reach into the minds of your customers and answer exactly what they want before they’ve even asked it…Okay, so we can’t mind read so where do we start? If you take your business seriously and want it to achieve its potential with content marketing, the first step should be getting hold of an SEO expert. The reason I’d recommend that than a total DIY approach or handing it to your marketing assistant, is because an SEO expert will be able to match appropriate keywords that your website actually stands a chance of ranking for. If you can’t afford to hire a pro, you’ll need to dedicate time to keyword research and analyse the amount of backlinks to your pages, your domain authority, clean up technical errors and then start putting together content. I’ve created an imaginary business, it’s a florist that’s been in business two years, hoping to sell a lot of wedding bouquets. 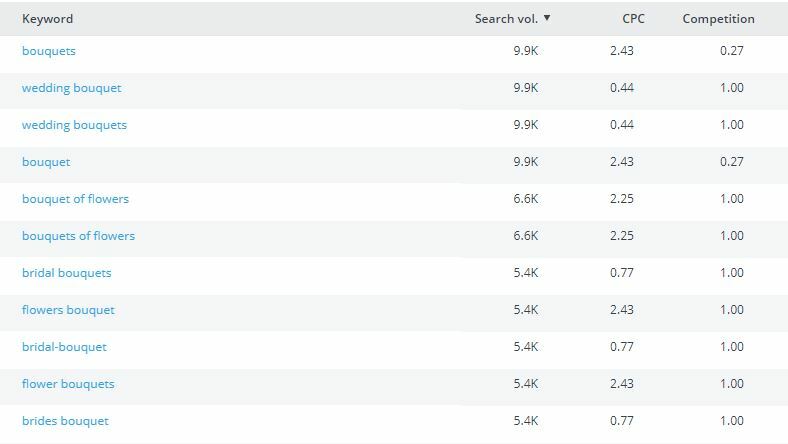 Now if you look at the keyword list below, you’ll see that there is an enormous amount of competition for similar search terms as ‘wedding bouquets.’ Every single senior manager, director or owner of a company that I’ve worked with want those giant keywords and only those. As you can see, ‘wedding bouquet’ has 9,900 searches per month, a high cost per click and an immense amount of competition. To summarise it, that’s not a good keyword for you to target unless you happen to own a supermarket chain that turns over billions. If you have a look at the next list of keywords, this is what I’d call good keyword research. As you can see, the searches per month are much lower, but the competition is next to none. If you could combine 1-3 of these into a blog post effectively, I’d call that perfectly good keyword research to kickstart your content marketing campaigns with a real possibility of seeing results. As you can see there’s a lot of seasonal themes and therefore a lot of potential to work through a great list of blog posts leading up to each season. One post could be an arrangement of flowers for wedding bouquet ideas, then you could do another on spring wedding ones and find some long tail keywords around each subject, maybe there are particular flowers that suit a Spring wedding? I usually spend a lot of time planning for my content marketing campaigns, making large lists using this approach with good keyword research. Then when it comes to writing the actual content, I’ve already covered the hardest part. I hope you found this helpful, I’ll be back in a few days. Take a look at my local Search Engine Optimisation post, which may also be helpful to you!